Do you buy a big bag of mandarin oranges but have trouble eating them all? Turn them into infused water! 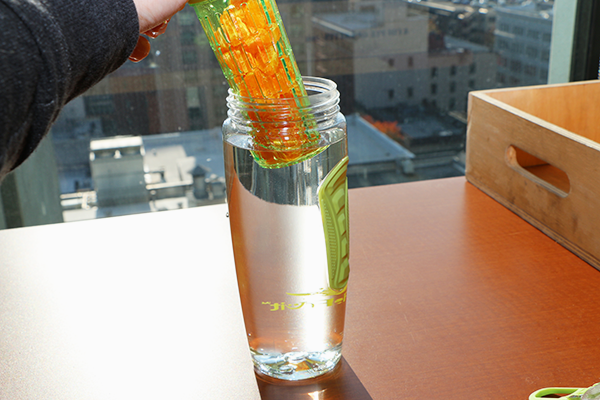 Tip: keep an infuser water bottle at work so you can grab fruits on your way out the door and infuse them during the day. Oranges, lemons, and strawberries make excellent single-ingredient infusions with a lot of flavor. Remove the rind and separate the mandarin slices with your fingers. It’s okay if the slices are in groups of two or three. Important: cut the slices in half with a knife. This will allow the juices to seep out and infuse. Fill your water bottle and lower the infusion chamber into the water. Running water over the infusion chamber will result in floaters. Put the water bottle in the refrigerator for 4-8 hours, or overnight. Longer infusions result in more flavor. I often infuse mandarins for 24 hours. The taste is amazing! That’s beautiful Portland, OR in the background of these photos. 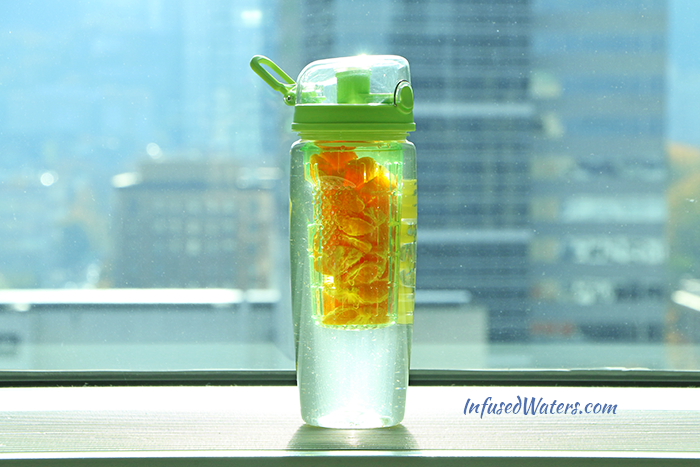 Fruit infused waters really help to brighten up gray skies! Yet another great “infusible” idea from Amy! Wondering if you have tried zest of grapefruit, lime, etc. Of course you have to slice it off carefully so as to avoid the bitter white pith. But I put a couple of slivers of the grapefruit skin in and it added an incredible amount of flavor for the tiny volume of skin. 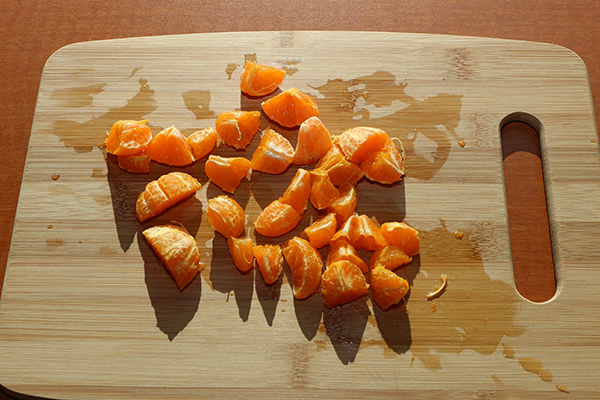 Seems like a great way to stretch the impact of your citrus fruits – use zest for a few days and then use the fruit. (of course, refrigerate your fruit after you start zesting it or it will dry out). I am so happy that I found your site! I’m new to infused water and trying to soak up some good info and nutrients! Excited to try out some of your recipes Amy! I am also new to the infuser.. I have just made the mandarin recipe so excitingly waiting the result tomorrow…. no website. But can’t wait to infuse. Can I add strawberries and oranges? You can add any fruit…Actually I put my oranges right in my water bottle(no infused)Sometimes I also add blackberries, blueberries, lemon slices, or whatever I feel like that day..It all works!! 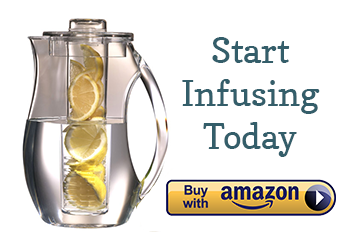 Anxious to start trying infuzed water. We are new to it. Hopen it can help me give up soda. Hope to be able to start infusing soon. 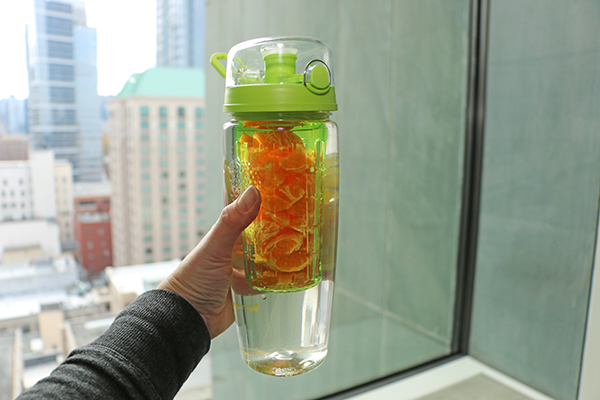 can you mix lemon and oranges together for infused water? Can you just use a plastic gallon pitcher? I’m drinking the cucumber, chilli and mint water today. It’s so refreshing, I’m going to work through your recipes, glad I found you!